Well Nike is consistent with these Machspeeds. From driver to 3 wood to this hybrid, they are all very square-shaped. The whole idea is to make the clubs more aerodynamic for faster swing speeds. I think this makes more sense with the big 460cc driver, but I'm not really sure how it applies to this small hybrid. 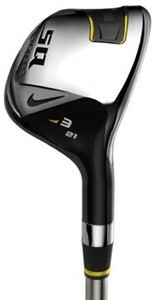 In addition to the stable clubhead, it has a very hot face due to the 455 stainless steel face. I recommend this hybrid to mid to high handicappers that are looking for a forgiving golf club that will hit the ball long and far from any lie. If you are looking for a hybrid that is a little more controllable and not so big, I recommend the Titleist 909 H Hybrid and the Mizuno MP CLK Hybrid.